Anyway, a few weeks ago, I caught the end of one of Food Network’s new shows, Farmhouse Rules, where host Nancy Fuller (who I can only assume is the network’s replacement for Paula Deen, given her aesthetic and cooking style) was preparing a kale salad. As far as I’m concerned, kale salad can do no wrong. I have about four I can make right now that are knock-out good. Trendy super food, whatever, kale is just tasty. Mixed with some kind of vinaigrette, maybe a little something sweet like golden raisins or apple, salty cheese, or smoky spices? Unbelievably good! But with this particular kale salad, this new, modern Paula was adding raw brussels sprouts into the same bowl and, admittedly, that gave me a bit of pause. Listen, I will eat brussels sprouts five times a week if you give them to me roasted with olive oil, salt, and pepper. They get all browned, sweet and nutty, and before I know it, I’ve eaten what’s leftover on the baking sheet while cleaning up the kitchen. I love brussels sprouts, but I’d never eaten them raw and along with an already fairly tough raw green, such as kale, I was skeptical. But it turns out, Miss New Paula was on to something and together, the kale and brussels sprouts made a delicious, quite fancy looking salad that even my vegetable-phobic beau ate with great zeal. This one is a total keeper and brings me up to five kale salads I can make with ease and from memory. Am I catch or what? In a medium sized bowl, grate garlic and add dijon mustard, honey, lemon zest, lemon juice, orange juice, salt & pepper. Mix until combined and then drizzle in olive oil while whisking. When all is incorporated, taste for seasoning and then set aside. In a large bowl, shred 1lb of brussels sprouts on a box grater. De-vein kale leaves. Stack kale leaves on top of one another, several at a time, and roll into a tight cigar before slicing into thin ribbons. 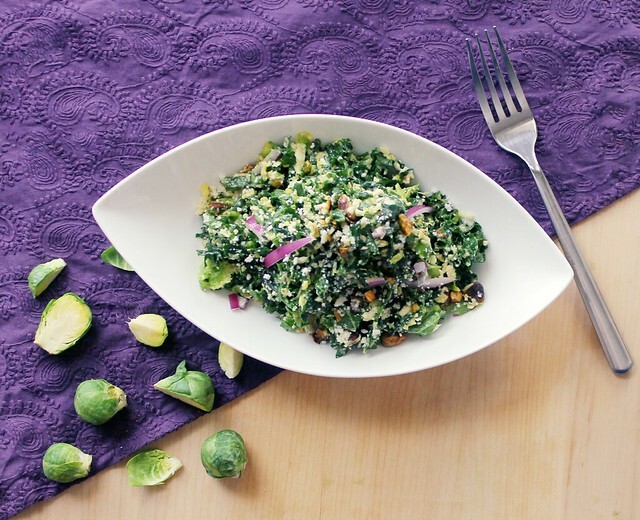 Add kale to bowl with brussels sprouts and follow with thinly sliced red onion. Add dressing to the vegetables and add cheese. Toss to combine. 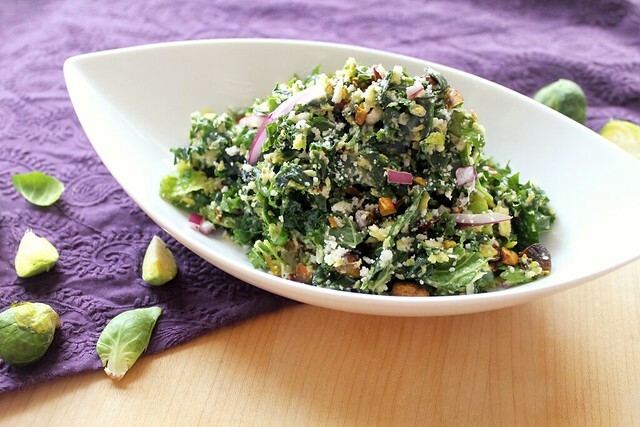 Allow to sit for 15-20 minutes so that kale and brussels sprouts lose some of their toughness and flavors meld. Add in pistachios and toss once more before serving. Delicious cold or at room temperature. Awesome! Let me know how you like it, Amanda. Hope you’re keeping warm! This recipe has been haunting me. I bought the necessary veggies last Sunday, and have everything else in my pantry or cellar. I intend to create a masterpiece this weekend, but because I am not particularly fond of lemon on my salads (or even on fish for that matter – odd, I know), I may omit the lemons and use raspberry vinegar with walnut or sesame oil instead. Thank you for sharing this inspiration! I think raspberry vinegar and walnut oil, particularly, sound delicious. You’re right to stray from the original recipe if you’re not a big lemon fan because this recipe is the lemoniest. Let me know how your version comes out. I’ve had a bottle of raspberry vinegar for quite a while and I use it so rarely, but this is an inspiring idea!